Should I Move My Blog? Having bought the domain jamesmichie.com and spent some time creating a landing page, I would like to move my blog to jamesmichie.com/blog. However, Blogger will not allow me to do this as it is neither the original domain nor is it a sub-domain. Therefore, I have been left with a choice. Keep my blog where it is and redirect from jamesmichie.com/blog (as it does now) or move my blog to a different blogging platform. This could be quite a bit of work and is therefore not an easy decision to make. What do you think? Stick with Blogger? Move to WordPress? Or move to Posterous? Your thoughts and comments are welcome. 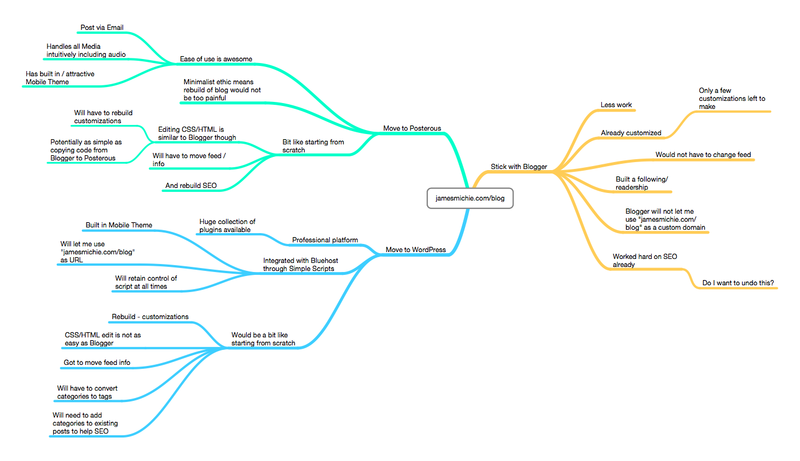 To view the mind map as a downloadable PDF click here. It's the summer now! First day of school holidays to be exact. The post is helpful but to achieve what I want, it will not be a perfect solution and I am a bit of a perfectionist with things. Moving my blog will potentially, in the long run, leave a cleaner set up of domain names and redirection. This will also offer better SEO which I feel is quite important. I'm currently 65/70% in the ready to move camp. Just looking for a further 10/15% reassurance that it is the best route to take. And I'm unsure about which platform will serve me best: WordPress or Posterous? Then I'd go with Posterous. I use WordPress at the moment and I do like it a lot but my one week Posterous project demonstrated how immediate blogging with Posterous can be and that's what I miss now using WordPress. I'm also contemplating switching to Posterous and may do so during the holidays. WordPress has so many features and plugins that you could spend more time tinkering and playing rather than just blogging. Hmm, am I trying to talk you into using Posterous or myself! [Edit] I have decided to develop both and see which I prefer! So far WordPress is winning, which I am surprised about. Posterous is really struggling to deal with some of the code I am copying over from Blogger whereas WordPress is taking most of it with little need of tweaking.